The gamma ray spectrometer has measured the abundance and distribution of many elements of the periodic table, including hydrogen, silicon, iron, potassium, thorium, and chlorine. Knowing what elements are at or near the surface gives detailed information about how Mars has changed over time. 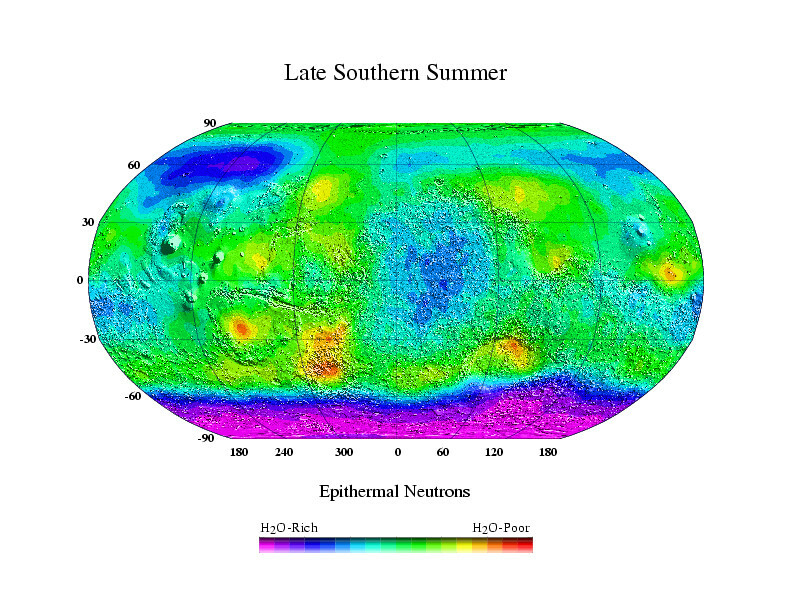 To determine the elemental makeup of the martian surface, the experiment uses gamma ray spectrometer and two neutron detectors. This map is based on gamma rays from the element hydrogen on Mars. 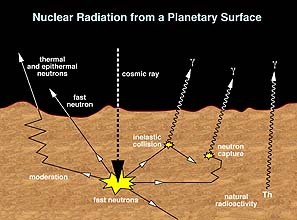 When exposed to cosmic rays (charged particles in space that come from the stars, including our sun), chemical elements in soils and rocks emit uniquely identifiable signatures of energy in the form of gamma rays. 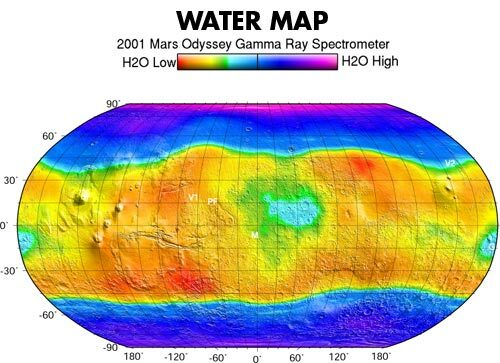 The gamma ray spectrometer looks at these signatures, or energies, coming from the elements present in the Martian soil. 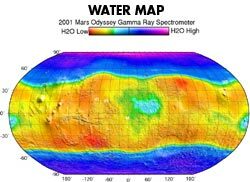 By measuring gamma rays coming from the martian surface, it is possible to calculate how abundant various elements are and how they are distributed around the planet's surface. Gamma rays, emitted from the nuclei of atoms, show up as sharp emission lines on the instrument's spectrum. While the energy represented in these emissions determines which elements are present, the intensity of the spectrum reveals the elements concentrations. 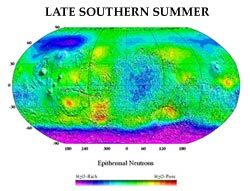 The spectrometer has added significantly to the growing understanding of the origin and evolution of Mars and the processes shaping it today and in the past. For detailed results, please see the Mission Success "Mission Success" story. How are gamma rays and neutrons produced by cosmic rays? Incoming cosmic rays--some of the highest-energy particles--collide with atoms in the soil. When atoms are hit with such energy, neutrons are released, which scatter and collide with other atoms. The atoms get " excited" in the process, and emit gamma rays to release the extra energy so they can return to their normal rest state. 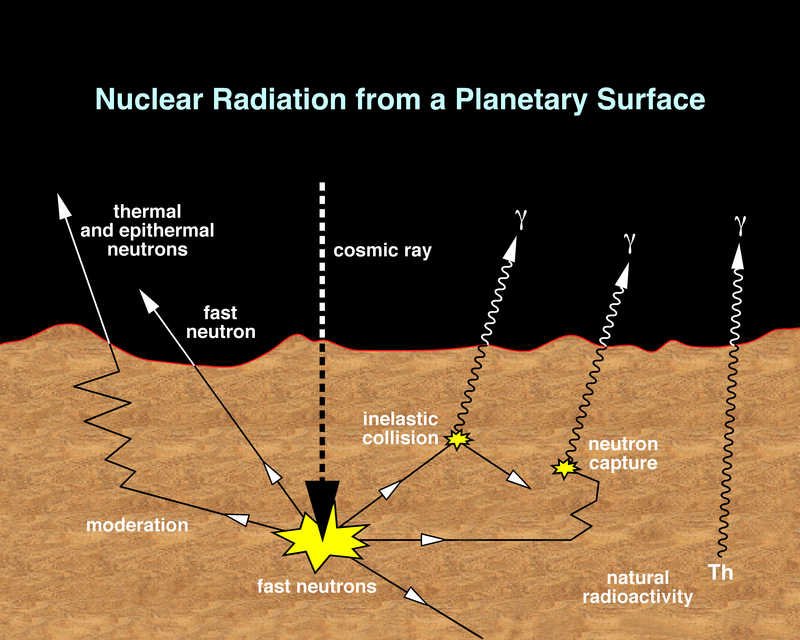 Some elements like potassium, uranium, and thorium are naturally radioactive and give off gamma rays as they decay, but all elements can be excited by collisions with cosmic rays to produce gamma rays. The HEND and Neutron Spectrometers on GRS directly detect scattered neutrons, and the Gamma Sensor detects the gamma rays. By measuring neutrons, it is possible to calculate the abundance of hydrogen on Mars, thus inferring the presence of water. The neutron detectors are sensitive to concentrations of hydrogen in the upper meter of the surface. Like a virtual shovel "digging into" the surface, the spectrometer allows scientists to peer into this shallow subsurface of Mars and measures the amount of hydrogen that exists there. Since hydrogen is most likely present in the form of water ice, the spectrometer is able to measure directly the amount of permanent ground ice and how it changes with the seasons. In the late southern summer on Mars in 2003, the buried ice in the north was not visible due to the thick polar cap of carbon dioxide. The gamma ray spectrometer consists of four main components: the gamma sensor head, the neutron spectrometer, the high energy neutron detector, and the central electronics assembly. The sensor head is separated from the rest of the Odyssey spacecraft by a 6.2-meter (20-ft) boom, which was extended after Odyssey entered the mapping orbit at Mars. The boom distances the GRS from the spacecraft to minimize interference from any gamma rays coming from the spacecraft itself. The two neutron detectors-the neutron spectrometer and the high-energy neutron detector-are mounted on the main spacecraft structure and have operated continuously throughout the mapping mission.